Slowly the lights dim. An expectant hush falls on the audience. An announcer's voice intones: "Ladies and gentlemen... Luciano Pavarotti!" And suddenly a big golf-cart comes roaring out of the wings, pulls up center stage, and two big burly stagehands get out and grab Pavarotti and heft his bulk into an upright position at the microphone. They jump back into the cart and drive off, and Pavarotti begins singing "Vecchia zimarra, senti" from "La Bohème". Inbetween Massenet and Mozart, Pavarotti does a spirited rendition of "Purple Haze". Bootleggers in the audience make illegal recordings and sell the pirated editions later for hundreds of dollars. Reviewers in small music 'zines say Pavarotti's version is even better than Hendrix's original. The popularity is seen as a new market trend. Laurence Dale and Kiri Te Kanawa are contracted by eager promoters to recreate old Jefferson Airplane albums, with Te Kanawa singing the part of Grace Slick. Te Kanawa's spirited version of "White Rabbit" climbs the charts. Ten years pass by. Soon all that remains of the movement are jaded memories and the K-Tel record collection of "'60's Classics As Performed By Great Opera Stars". Singing a powerful aria from "Das Rheingold", Pavarotti sings the part of Donner as he calls forth the thunder of the storms of the Gods. A thick copper cable runs to Pavarotti's feet. At the offstage end is a 1.5-megavolt Tesla coil. "Auf des Hammers Schwung, schwebet herbei!" ("As my hammer swings, sweep from the sky! "), Pavarotti commands, and bolts of lightning begin to leap from his fingers. As he finishes the aria there is a brief and inexplicable power surge; the lightning arcs away from Pavarotti's fingers, and burns several foot-wide holes in the walls of the building. Pavarotti is performing a spirited recital from Rossini's energetic "Barber of Seville". The crowd is worked into a fever pitch. In spite of the efforts of the ushers and event security staff, the crowd repeatedly attempts to rush the stage. 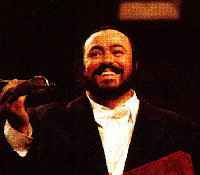 Pavarotti smiles, encouraging them. A mosh-pit begins to form in front of the stage as the fans get carried away. Getting into the spirit of the crowd, Pavarotti attempts a stage-dive and crushes five people. Big finale. Pavarotti is going through the final bars of "Don Giovanni". 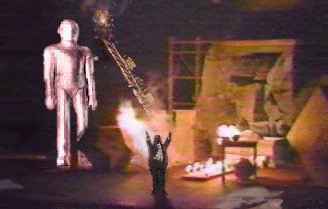 Pavarotti sings Giovanni's part; the part of the Statue is a recording of Pavarotti's voice being played through a gigantic thirty-foot-tall motorized android. The android goes crazy and starts smashing stage equipment. Two lighting trusses crumple and crash to the stage. Pavarotti faces down the horror. He sings his final aria with such strength that the android bursts apart, shooting sparks and red-hot metal fragments in all directions. But the note is too powerful to hold. Pavarotti holds it anyway and the resonant force of his own voice causes him to burst into flames. He goes up in a massive conflagration. The orchestra rushes through the last few bars of the song and flees for their lives as the orchestra-shell collapses. Roadies run on stage and try to stop the half-destroyed, out-of-control robot. Pavarotti burns. Hundreds of screaming women in the audience excitedly hurl their underwear into the fire. Maybe I should go into production design.